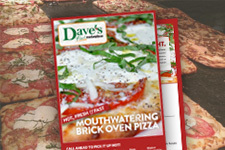 At Dave's Fresh Marketplace we do not use manufactured ground beef. We cut and grind our own ground beef throughout the day, ensuring that you get the freshest ground beef available. We offer three grades of leanness: 86%, 91% and 93%. 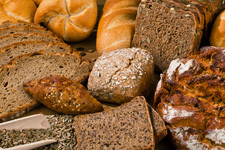 Each batch is tested for leanness and quality. Did you ever wonder why the center of ground beef package looks darker than the surface? There's no need to be concerned, it's natural! 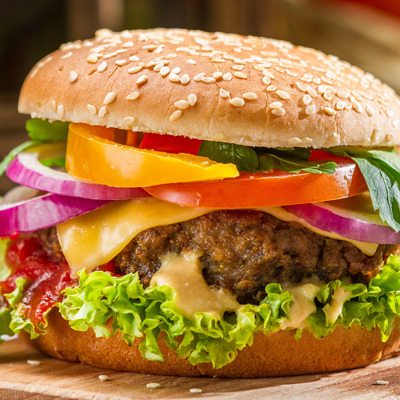 The ground beef on the surface is exposed to oxygen in the air we breathe. The plastic wrap is permeable and allows some in. This keeps the surface a nice red color. The interior stays dark through lack of oxygen. When you open the package, exposing the interior to oxygen, it will turn red. The ideal temperature for storing all fresh meat is between 28-32°F. Therefore it is best advised to store ground beef in the coldest part of your refrigerator. If ground beef is not going to be consumed within 2 days of purchase it is advisable to freeze it. Ground beef can be frozen for up to 4 months. If you decide to freeze it, tightly wrap it in heavy-duty freezer paper, aluminum foil or freezer bags. Make sure you observe the time frame for freezing by making a note of the dates. When thawing, place the ground beef in the refrigerator (never at room temperature). Place it on a plate in order to collect any juices, which will leak during the thawing process. For a quicker that you may place it in an airtight bag and set it under cold running water. Cook as soon as possible after thawing this way. If using a microwave when thawing, make sure you cook the product immediately. 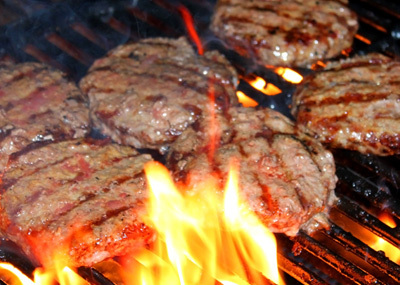 The USDA recommends cooking ground beef to at least 160°F in order to kill harmful bacteria such as e.coli. Always serve well done ground beef to children and senior citizens. The center should be brown and the juices free of any pink, red or cloudy appearance. Some ingredients such as spices and vegetables used with the ground beef may cause the finished cooked recipe to retain some of this pink appearance. Certain sauces and marinades such as teriyaki and Worcestershire sauces may mask the doneness of the beef. Always use a thermometer to check internal temperatures of any ground beef recipes. 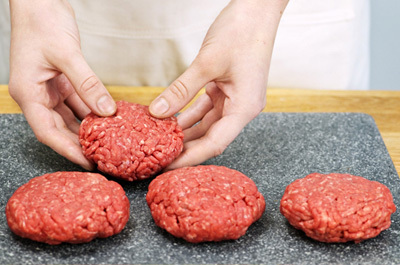 When preparing anything with raw meat keep everything clean - hands, counters, utensils, cutting boards, sinks and all other work surfaces the meat may come into contact with. This is one of the best defenses against food borne illness. Keep different meat families separate - eg. Meat, poultry, lamb and pork. Thoroughly sanitize hands, utensils, and all work surfaces when changing meat groups. This will avoid cross contamination from one type of meat to another. Wash hands before and after handing raw meats. Use soap and hot water and rub hands together for at least 20 seconds. Clean all utensils and works surfaces thoroughly and allow to air dry for better sanitation. As always, place cooked food on clean dishes for serving.